Mechanic's liens are governed under Chapter 572 of Iowa Code. A waiver is a conscious relinquishment of a right. In this case, the person granting the waiver is relinquishing the right to seek a mechanic's lien for all or part of the amount due. This assurance is usually enough to get the other party to pay. 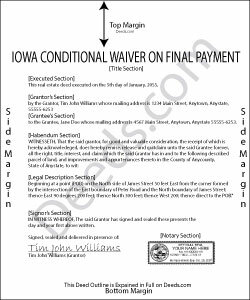 In Iowa, there are no statutory forms for waivers although according to the principles of contract law, the parties may agree to such modifications in writing. Generally, waivers come in four varieties: conditional or unconditional, and based on a partial/progress or final payment. Conditional waivers only become effective after the responsible party's check clears the bank on which it was drawn, and provide more protection for the claimants. Unconditional waivers go into effect immediately, tend to favor the owners' interests, and should only be used after payment is confirmed. Waiving lien rights after a partial payment allows the claimant to retain some lien rights, but to release others based on the amount paid on the overall balance due. Waivers upon final payments remove the claimant's eligibility to place a lien because they state that the account is paid in full. Regardless of the nature, waivers must identify the parties, the location of the project, relevant dates, and payments. Claimants might use a final conditional waiver when the full and final payment is made, but concerns exist about the payment method. For instance, if there are any concerns a final check won't clear, opt for a conditional waiver. The waiver is only effective upon the payment going through within a specified number of days. This article is provided for informational purposes only and should not be relied upon as a substitute for the advice from a legal professional. Please contact an Iowa attorney with any questions about sending notice to property owners or anything else with regard to mechanic's liens. Lenore H. said: I was very pleased with the service I received yesterday at the recorders office. no complaints at all. Served promptly and efficiently. Reply from Staff: Thank you! DEBORAH G. said: This product is good but the text boxes are not large enough to contain the information required for the form. Even dates do not display with the entry you make. William K. said: Thanks for the service which was excellent and timely. Instructions were easy to follow and results worth the cost. David A. said: Excellent service. I have been looking for a beneficiary deed for quite a wile with no success. My friend found your site and I was overjoyed. Fast, easy to use, and understand.I recommend this site to anyone. Jennifer B. said: I didn't care for it because I was having to do other things in between filling it out and all of a sudden it would not allow me back in it to make changes. Luckily I had saved it and then had to do FILL/SIGN option which looks ugly but that was the only way I could add what I needed. kathy d. said: very easy make sense instructions. Thank you. Reply from Staff: Thank you for your feedback Kathy. Have an amazing day!